How to Survive as a Firefly provides a unique take on insect science that will entertain and educate in and out of the classroom. Full of opportunities for extended learning, this book includes fun facts hidden throughout the hilarious illustrated story - and after, a glossary of important terms and some real photos of fireflies. If you've ever wondered how these fascinating beetles grow and glow, and you like to laugh while you learn, this book is for you. 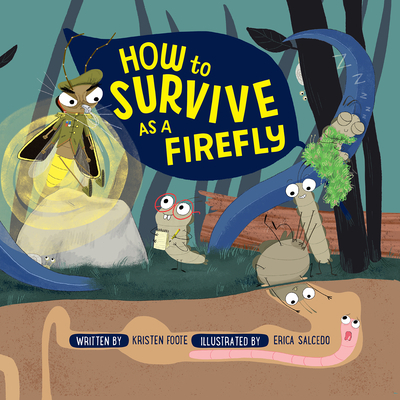 KRISTEN FOOTE is the author of How to Survive as a Firefly and How to Survive as a Shark. With a degree in biology, she is a firm believer that learning about science can be fun (and funny!). She's a Colorado transplant who, when not writing, is enjoying everything the Rocky Mountains have to offer with her husband and two kids. How to Survive as a Firefly is her first book. ERICA SALCEDO is a Spanish illustrator. She studied fine art at Castilla-La Mancha University and holds a master's in illustration and graphic design. She has illustrated several books with publishers from around the world, including Wolfish Stew (Bloomsbury) and Department Store Sticker Book (Usborne Publishing).